Posted on November 14, 2018 at 12:05 pm. To celebrate the launch of Betsoft’s revolutionary Max Quest: Wrath of Ra online slot game, Casino-Mate.com is giving away €50,000 between now and November 30, 2018. Play the game with real money bets to earn points and score one ticket into the prize draw for every 100 points you rack up. Every player who finishes in the top 1770 on the points leaderboard is guaranteed to take home a share of the €50k pool. Released this month, Max Quest is a game-changing Betsoft casino design that blends advanced slot features with adventurous gameplay, stunning graphics and a unique multi-player format. 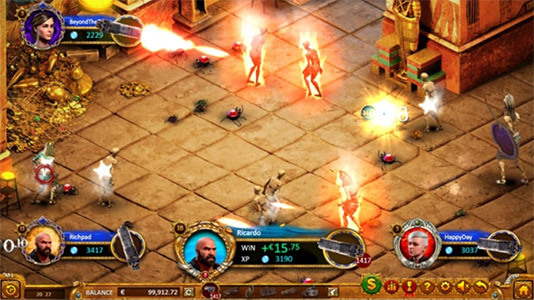 Players follow a band of intrepid treasure hunters as they fight their way through zombies, mummies and all sorts of nightmarish obstacles in the ancient tombs of Egypt. This promotion is only available to real money players at Casino-Mate, where new customers can pocket up to €1400 bonus cash and 80 zero-wager spins upon joining. Casino-Mate.com no longer accepts players from Australia. However, Aussie gamblers can take advantage of an even bigger welcome bonus – up to $2000 – and heaps more weekly promos at the new Joka Room Casino.